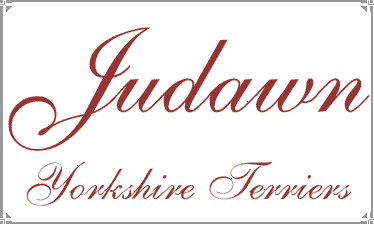 Here at Judawn we breed on a very limited basis,averaging just a few litters per year. Our litters are carefully planned and bred with thoughts of health, beauty and temperament. Most of our puppies come from Champion parents and are all sold on a CKC non breeding contract with a spay/neuter clause in the health guarantee. Puppies are placed at approx. 12 weeks of age or older, with a Veterinarian check, tattoo, vaccines up to date and registered with the Canadian Kennel Club. Puppies are not recommended for very young children because of their small size and are too small to tolerate rough play from children. Grooming is a must and even with a " puppy cut " there is always a certain amount of grooming. If grooming is something you do not want to do, then this is not the breed for you. There is no such thing as "teacup" yorkies. The yorkie falls under the Toy breed catagory. On occasion we will have a puppy that is Tiny and we feel will not mature to 4lbs. These little guys are kept longer to ensure a healthy start . All Judawn puppies are home raised in a busy household with much coming and going and a household of other pets. We have two Golden Retrievers and 3 Ragdoll cats. My first litter of Yorkies was in 1987. I have been breeding and showing my dogs since that time both here in Canada and in the U.S.
We breed for quality, not for quantity!